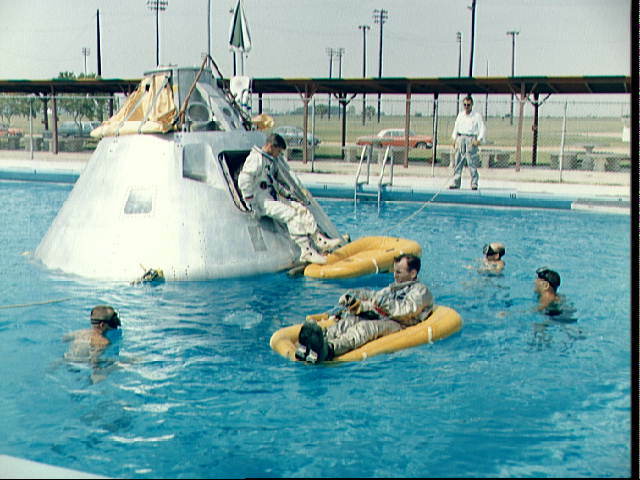 Prime crew for the first manned Apollo mission practice water egress procedures with full scale boilerplate model of their spacecraft. Astronaut Edward H. White II rides life raft in the foreground. Astronaut Roger B. Chaffee sits in hatch of the boilerplate model of the spacecraft. Astronaut Virgil I. Grissom, third member of the crew, waits inside the spacecraft.